The Republican Star, or, General Advertiser (Easton, MD), Maryland Republican, Baltimore Patriot and Mercantile Advertiser (Baltimore, MD). and The Torch Light and Public Advertiser (Hagerstown, MD) list Philip Reed with 701 votes. The Easton Gazette (Easton, MD) lists Philip Reed with 723 votes. The American, and Commercial Daily Advertiser (Baltimore, MD), the October 16th edition of the Richmond Enquirer (Richmond, VA) and the October 8th edition of the Daily National Intelligencer list Joseph Mitchell with 1306 votes and Philip Reed with 741 votes. The October 12th edition of the Torch Light lists 701 votes for Philip Reed. The Maryland Republican, Baltimore Patriot and Mercantile Advertiser (Baltimore, MD)., American, and Commercial Daily Advertiser (Baltimore, MD), Torch Light, Daily National Intelligencer and Republican Star list George E. Mitchell with 1261 votes and Philip Reed with 1013 votes. The Easton Gazette (Easton, MD) and the The Republican Star, or, General Advertiser (Easton, MD) lists 384 votes for George E. Mitchell. Also referred to as Lower District. The Easton Gazette (Easton, MD) and the The Republican Star, or, General Advertiser (Easton, MD) lists 62 votes for George E. Mitchell. Also referred to as Middle District. Also referred to as Upper District. Election Transcript. Historical Society of Harford County, Bel Air. 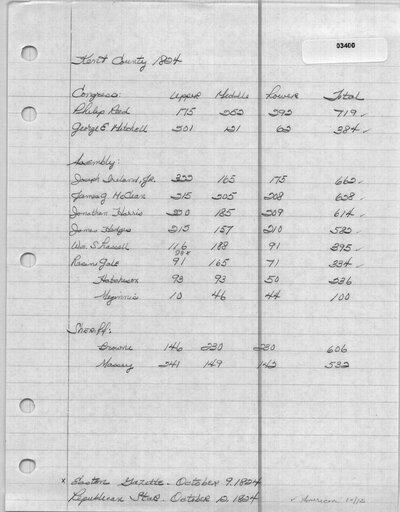 Kent County Pollbooks. Maryland State Archives, Annapolis. The American, and Commercial Daily Advertiser (Baltimore, MD). October 6, 1824. Baltimore Patriot and Mercantile Advertiser (Baltimore, MD). October 6, 1824. American, and Commercial Daily Advertiser (Baltimore, MD). October 7, 1824. Daily National Intelligencer (Washington, DC). October 7, 1824. Daily National Intelligencer (Washington, DC). October 8, 1824. Easton Gazette (Easton, MD). October 9, 1824. The Maryland Republican and Political and Agricultural Museum (Annapolis, MD). October 9, 1824. Republican Star, or, General Advertiser (Easton, MD). October 12, 1824. The Torch Light and Public Advertiser (Hagerstown, MD). October 12, 1824. Richmond Enquirer (Richmond, VA). October 16, 1824.